The mystical, yet modern and bustling city of Quito is the capital of Ecuador. Quito is built on the remains of an ancient Incan city and home to well over 2 million people. 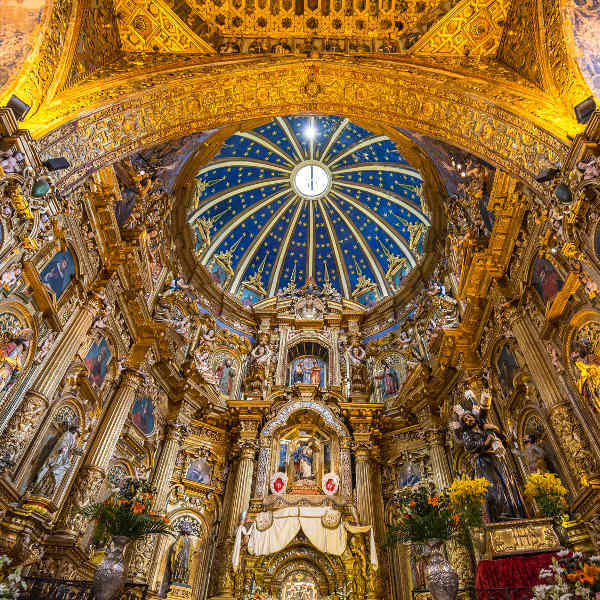 Situated high on the Andean foothills, Quito is famed for its unique architectural blend that includes 16th century churches and the Plaza Grande Square. Cheap flights to Quito are now available for a limited period of time, so get ready to explore the intriguing history and beautiful culture of Ecuador’s capital! Quito is served by the Mariscal Sucre International Airport (UIO) which is a 40-minute drive from the city centre. 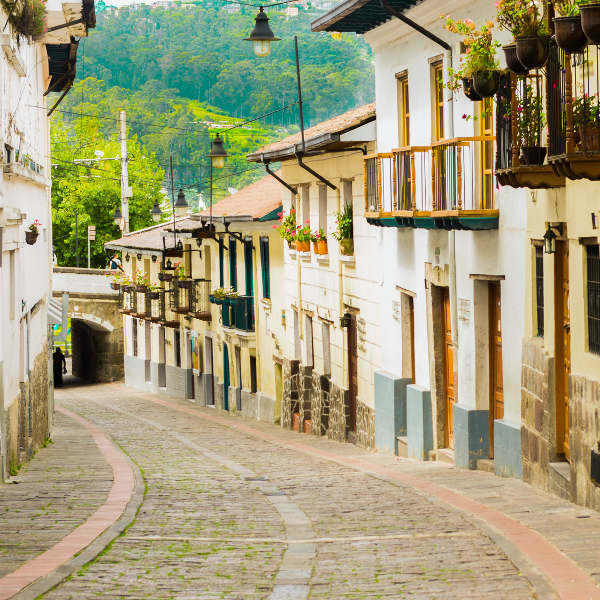 Old Town is the cultural and historic hub of Quito. Explore the streets lined with blended architectural styles or relax at one of the many restaurants and cafes serving local treats. Famed for its unique architectural blend and majestic 16th and 17th century churches, the city boasts an array of gorgeous sites to visit, including the 16th century Church of San Francisco. 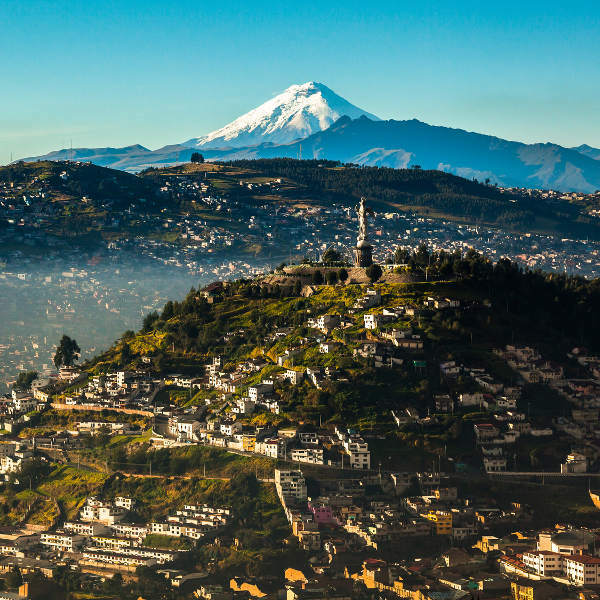 Admire Quito’s natural beauty from the TelefériQo cableway; spot the magnificent El Panecillo hill and Virgin of Quito statue or explore the scenic trails of the Pichincha Volcano on foot or mountain bike. Situated up-high on the Andean foothills, Quito experiences a constant cool climate and only two seasons, a dry summer (June to September) and wet winter (October to May). The summer season, as well as the festive months of December and January, see the city at its peak tourist season. The dry summer conditions and pleasant temperatures are perfect for exploring the old town streets or mountain biking on the slopes of Pichincha Volcano. Off-peak travel season falls between February and May, and October and November. The streets are less crowded, attractions are easily accessible and prices drop during this period. Although these are the rainy, winter months in the city, the temperatures are still pleasant. Celebrate with the locals at their traditional Quito Carnival, a week before Lent in February or March, or learn about Quito culture on the 1st and 2nd of November at the annual ethnic festivals of All Saints' Day (Todos los Santos) and Day of the Dead. Built on the remains of an ancient Incan city, Quito maintains the intrigue of a magical ancient city but also offers a vibrant urban life and culture. Situated high on the Andean foothills, it is the capital city of Ecuador and famed for its unique architectural blend that includes 16th and 17th century churches and the Plaza Grande Square. Explore the streets of Old Town where the majority of the majestic 16th and 17th century churches are to be seen, including the Church of San Francisco, the Church of the Society of Jesus and the Church of Santo Domingo. La Mariscal, one of the more vibrant cosmopolitan city districts, is a popular tourist spot with a wide range of stores, restaurants and bars for you to enjoy. Quito offers excitement and adventure with its variety of trails and valleys to hike or mountain bike through. Don’t miss an opportunity to admire Quito’s natural beauty from the TelefériQo cableway where you will be able to spot the magnificent El Panecillo hill and Virgin of Quito statue. The scenic slopes of Pichincha Volcano is a must see, whether on foot or cableway. Compare several airlines, and book your cheap flights to Quito online at Travelstart. Make sure your routine vaccines that include the MMR vaccine, DPT, Chickenpox, Polio and yearly flu shots are updated before travel. As an additional precaution, you can get the Hepatitis A, B and Typhoid vaccines and a Rabies vaccine as you may be exposed to stray dogs, bats and other mammals in Ecuador. A Yellow Fever vaccination and medication to prevent Malaria is recommended. Visitors to Ecuador must obtain a yellow fever certificate to be allowed back into South Africa. The Zika virus is also a risk in Ecuador and it is recommended that you protect yourself from mosquito bites with mosquito nets, repellents etc. Sexual transmission of Zika is possible and infection in pregnant women can cause serious birth defects; it is therefore recommended that you not travel to Ecuador if pregnant. As in any major city, crime does occur in Quito. You should practice normal safety precautions, keep your valuables and important documentation safe and watch out for petty crimes like bag-snatching or pick-pocketing, especially in crowded streets of south Quito and the popular tourist area of Mariscal Sucre district. Avoid travelling on foot alone, especially at night, and only make use of marked taxi cabs.